For the past years, saturated fat has been getting a lot of negative press on the media. Since coconut fat is 92-96% saturated, it has gotten its (un)fair share of negative attention too. I’m still eating it and using coconut oil for the beard as a beard oil. Below, is my reasoning. If you look behind the scenes of the mass media fat demonization, you will quickly see that there’s a mounting pile of evidence which suggests that coconut oil, with its high saturated fat content, is actually protective against cardiovascular disease1, and its even pretty good at balancing cholesterol (more HDL, less LDL2) and blood lipids3. Heck, the Tokelau population in South Pacific eat roughly 60% of their calories from coconuts and still, cardiovascular disease is extremely uncommon there4. Same goes for the Kitavan’s in Papua New-Guinea, who eat coconut as their main source of fat, yet heart disease appears to be absent among these people5. …When you factor in coconut fats pro-thyroid effects, ability to increase metabolic rate6, and ability to increase antioxidant status7, you will quickly realize that coconut oil is in fact one of the better fats to consume. NOTE: Coconut oil is also perfect for cooking since its mainly saturated and low in cholesterol, which means that it’s not that prone to oxidation. What makes coconut oil different from many other sources of saturated fat (animal fats, eggs, butter, lard) is the fact that the vast majority of the fatty-acids are MCTs (medium-chain triglycerides), which is a fancy term to describe a fatty-acid that has anywhere from 6 to 12 carbon chains attached to it. MCTs are metabolized differently from many other fats since your body shuttles them directly into the liver where it uses them as instant energy or converts them into ketone bodies. This unique effect of MCTs is likely the cause of its ability to increase metabolic rate. 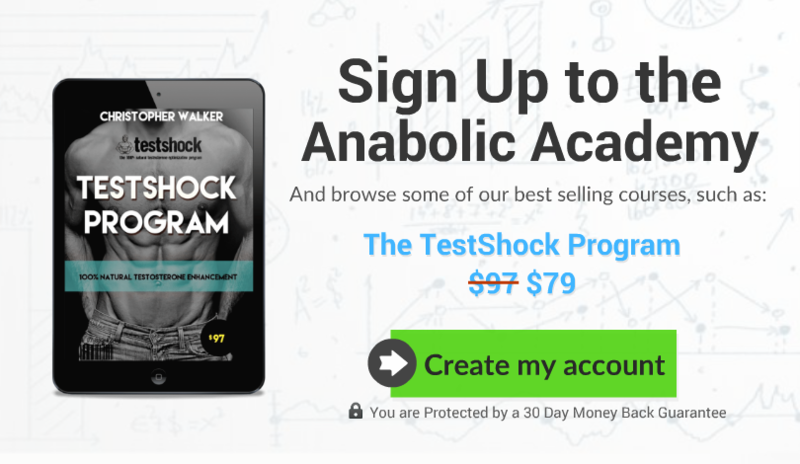 Since coconut oil is mainly saturated – and saturated fats are considered the best type of fat for increased testosterone production – it’s only natural to think that coconut oil would be pretty good for T production. Coconut oils ability to increase the antioxidant status of the body and pro-thyroid effects would also suggest that the oil would be a good fit for a T-boosting diet. Even though there aren’t any studies readily available which would of have examined coconut oils effect on testosterone levels in human males, there are still plenty studies like that with male rodents as subjects (which share nearly identical reproductive systems to humans). There’s evidence that coconut oil – largely due to its antioxidant effects – is able to prevent oxidative stress in testicles, and therefore also preserve testosterone levels from oxidative damage8. When four groups of male Wistar rats were fed with diets containing either soybean oil, coconut oil, grape seed oil, or olive oil, the researchers noted that the activity of key enzymes needed in testosterone production (3-β-HSD and 17-β-HSD), were significantly higher in the olive oil and coconut oil groups. Testosterone levels were also noticeably higher among the rodents who consumed either olive oil or coconut oil9. In a study where rats received a combination of calcium, vitamin D, and boron10 with either canola oil, sunflower oil, canola + sunflower oil, or coconut oil (to go with the micronutrients), the group receiving coconut oil (+the supplements) noted significantly higher testosterone levels than the groups which received other oils (NOTE: read more about boron and vitamin D3). In a study where 6 groups (8 rats in each) were fed with six different fat sources11 – sesame oil, sunflower oil, fish oil, olive oil, Iberian pig lard, or coconut oil – it was noted the groups which received coconut oil and Iberian pig lard had significantly higher serum testosterone levels than rest of the groups. It’s also worth mentioning that the lard group had significantly higher T levels than any of the other studied fat sources (including coconut oil! ), while also having lowest LDL and highest HDL cholesterol levels. NOTE: Many guys are scared that coconut oil would lower DHT levels by inhibiting 5-a reductase enzyme (I was too at first). This study12 which shows how free-form lauric-acid and myristic-acid did just that in-vitro is often cited along with the claims. However, it’s important to note that the fats used in the study were free fatty-acids, which are the type found in rancid oils. What you normally get by eating non-rancid coconut oil is the triglyceride form, which I doubt causes similar effects. Yesterday night while I was trying to find more confirmation to that, I stumbled upon an old forum thread where a guy had followed a “Dr. Ray Peat inspired diet” with coconut oil and butter is the main sources of fat, going from a normal diet to that, his T levels had increased by 28% and DHT by 31% in 6 months. If coconut oil would lower DHT, I doubt the results would look like that. In my opinion, coconut oil is one of the best dietary fat sources around. coconut oil is cardio-protective, can increase metabolic rate, its a good source of T-boosting saturated fat, and has worked quite well for T levels in a few animal studies. 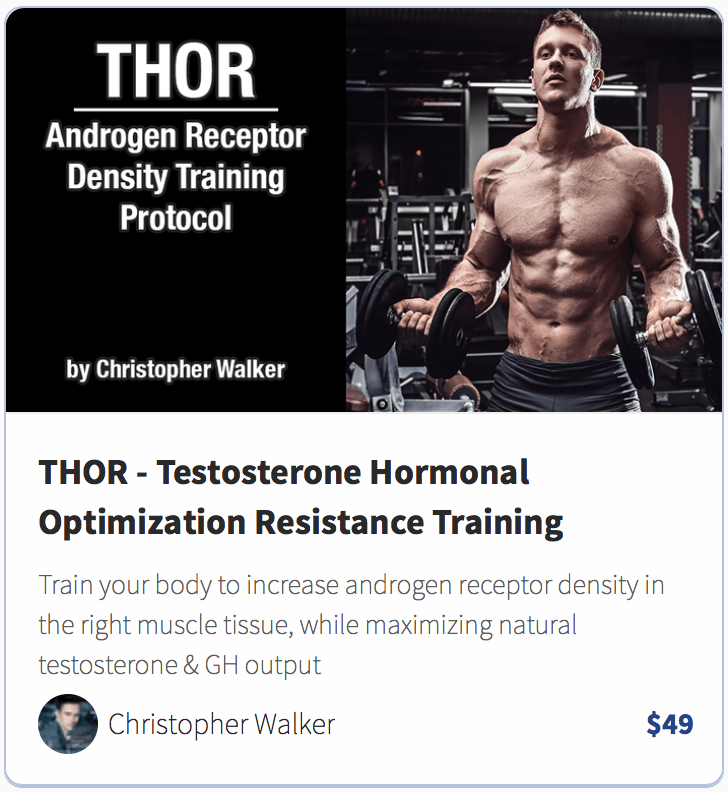 …After all, both of the enzymes are needed when the body converts weaker androgens (DHEA, androstenediol, and androstenedione) into testosterone. 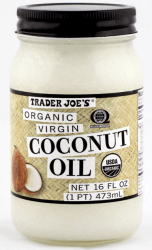 NOTE: Make sure to get organic virgin coconut oil (affiliate link), the real deal, instead of that hydrogenated trans-fat kind you can find on some supermarkets. Mensink R, Zock P, Kester A, Katan M. Effects of dietary fatty acids and carbohydrates on the ratio of serum total to HDL cholesterol and on serum lipids and apolipoproteins: a meta-analysis of 60 controlled trials. Am J Clin Nutr. 2003;77(5):1146-1155. Assunção M, Ferreira H, dos S, Cabral C, Florêncio T. Effects of dietary coconut oil on the biochemical and anthropometric profiles of women presenting abdominal obesity. Lipids. 2009;44(7):593-601. Nevin K, Rajamohan T. Beneficial effects of virgin coconut oil on lipid parameters and in vitro LDL oxidation. Clin Biochem. 2004;37(9):830-835. Prior I, Davidson F, Salmond C, Czochanska Z. Cholesterol, coconuts, and diet on Polynesian atolls: a natural experiment: the Pukapuka and Tokelau island studies. Am J Clin Nutr. 1981;34(8):1552-1561. Lindeberg S, Lundh B. Apparent absence of stroke and ischaemic heart disease in a traditional Melanesian island: a clinical study in Kitava. J Intern Med. 1993;233(3):269-275. Seaton T, Welle S, Warenko M, Campbell R. Thermic effect of medium-chain and long-chain triglycerides in man. Am J Clin Nutr. 1986;44(5):630-634. Marina A, Man Y, Nazimah S, Amin I. Antioxidant capacity and phenolic acids of virgin coconut oil. Int J Food Sci Nutr. 2009;60 Suppl 2:114-123. Famurewa A, Ejezie F. Polyphenols isolated from virgin coconut oil attenuate cadmium-induced dyslipidemia and oxidative stress due to their antioxidant properties and potential benefits on cardiovascular risk ratios in rats. Avicenna J Phytomed. 2018;8(1):73-84. Hurtado de, de A, Marra C. Dietary lipids modify redox homeostasis and steroidogenic status in rat testis. Nutrition. 2008;24(7-8):717-726. Naghii M, Darvishi P, Ebrahimpour Y, et al. Effect of combination therapy of fatty acids, calcium, vitamin D and boron with regular physical activity on cardiovascular risk factors in rat. J Oleo Sci. 2012;61(2):103-111. Segarra A, Ramirez M, Banegas I, et al. Dietary fat influences testosterone, cholesterol, aminopeptidase A, and blood pressure in male rats. Horm Metab Res. 2008;40(4):289-291.